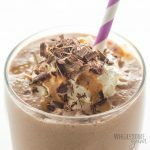 This keto chocolate peanut butter smoothie recipe will be one of your fave healthy low carb smoothies. So creamy, and ready in 5 minutes with 5 ingredients! 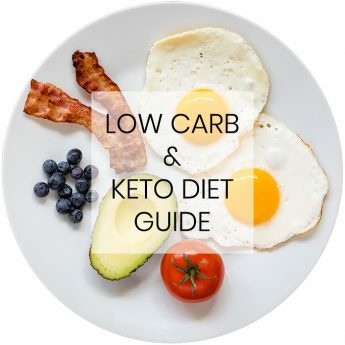 If you’re following a low carb lifestyle, chances are that you’ve run across family members not always wanting to go along with every aspect. My entire family is mostly low carb already, except for years my husband insisted on having a processed, sugar-filled powdered drink mix for breakfast. This healthy low carb smoothie recipe arose out of my millionth attempt to change that. And finally, a chocolate peanut butter smoothie was what did it! Needless to say, this alone makes this low carb breakfast smoothie worth its weight in gold, to me. It’s really an amazing feeling when I can help my family make better choices. I tried offering so many other breakfast options before I found one my husband would stick to. He really loved the drink he was used to, which tasted a lot like sweet chocolate milk. For a while, I couldn’t find anything he preferred over that drink. Not even eggs or almond flour pancakes or keto cinnamon rolls. He loves keto crepes, but even with those he didn’t want them every day. For some reason, he was set on having the same breakfast drink every day. At last, I discovered this chocolate peanut butter smoothie recipe. It’s much thicker than his chocolate-milk-like drink, and he admitted it’s even more delicious. (You can thin it out if you don’t want it thick, though.) Besides, it doesn’t get much better than peanut butter and chocolate together. There are a zillion ways to make low carb smoothies, but for this recipe I had to make sure that it would replace my husband’s processed breakfast drink. And I’m so excited that it did! That only five ingredients (not including the optional sea salt) – yay! See the recipe card below for the amounts. For my husband’s chocolate peanut butter smoothie, I also often add a couple scoops of collagen peptides. Feel free to throw that in there for added benefits! (If you’re not sure what those are, check out the benefits of collagen here. Now, I know some people may be wondering how this is a healthy chocolate peanut butter smoothie, with all that heavy cream. But, when you’re eating low carb, heavy cream isn’t really bad for you, and it can help keep you full. I buy organic heavy cream without any fillers. If you’re still on the fence about heavy cream – or if you want to make this recipe dairy-free and vegan – you can also use coconut cream instead! The smoothie will have a bit of that coconut flavor, but still totally delicious. With the coconut cream option, these ingredients are actually similar to this chocolate peanut butter nice cream recipe – but with different amounts. Making a chocolate peanut butter smoothie is just about the easiest thing ever. Throw everything in a blender and puree. At the end, you may need to adjust the amount of sweetener to your liking. Some people like their low carb smoothies more or less sweet, so decide for yourself. Just stick to either powdered or liquid sweetener, because granulated can be grainy. By the way, this low carb breakfast smoothie is super thick, so if you want to thin it out, feel free to add more unsweetened almond milk. I like it thick so that it’s kind of like a milkshake. 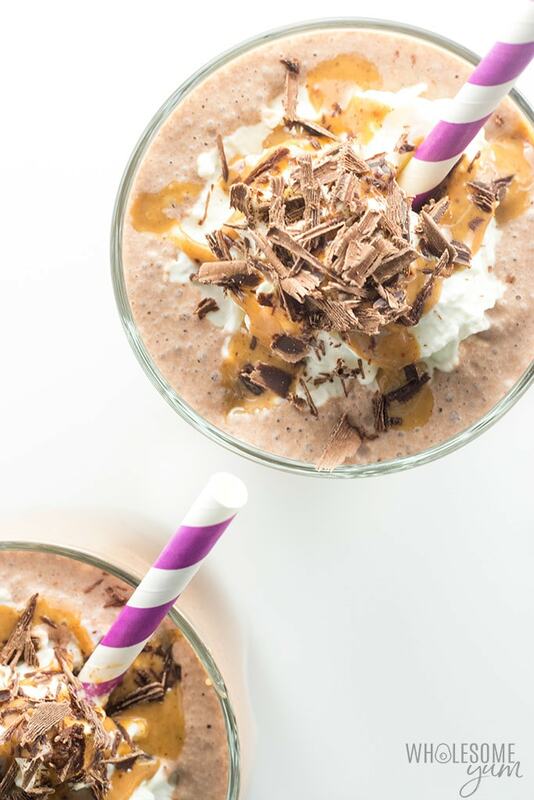 Don’t forget the toppings for your chocolate peanut butter smoothie! I didn’t include them in the ingredient list because you can choose to add them or not. For the pictures, I added whipped cream drizzled with more peanut butter and sugar-free chocolate shavings on top. They sure do look pretty and make this healthy low carb smoothie feel like dessert for breakfast! I’ve been on a meal prep kick lately (hello, Mason jar salad? ), so naturally I had to make my low carb smoothie recipe make-ahead-friendly, too. Since my husband has replaced his old breakfast drink with this smoothie every day, I like to make multiple servings for him ahead of time, to last a few days. If you want to do the same, it’s easy to adjust the number of servings on the recipe card to make as many as you’d like. Just change the number, and the ingredient amounts will all update. Your only limit is how much will fit in your blender! I usually make three or four servings at a time and store them in a large Mason jar like this. You can actually do this with any low carb breakfast smoothie, by the way. 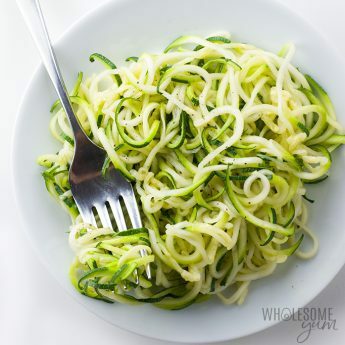 Try it with a strawberry avocado smoothie or even a keto green smoothie bowl. For some types of low carb smoothies, you might need to mix it again in a blender right before serving. But not for this one! 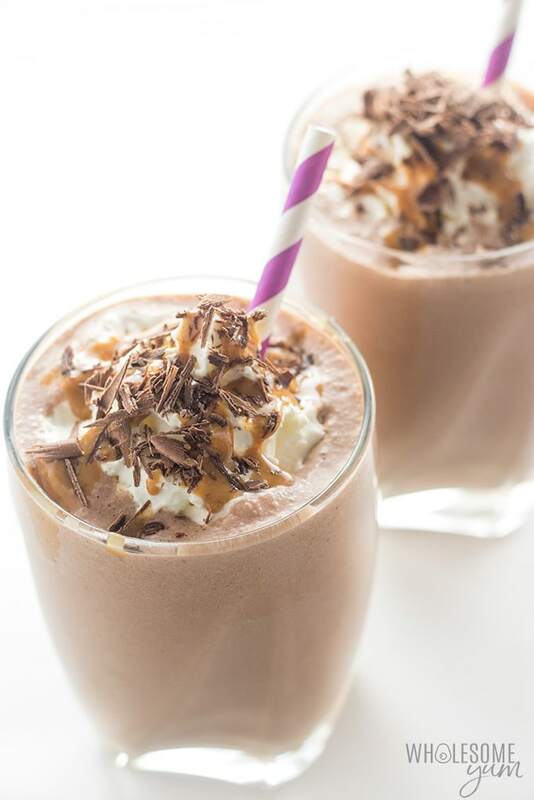 Just pour your chocolate peanut butter smoothie into a glass and enjoy! Puree until smooth. Adjust sweetener to taste if desired. Click or tap on the image below to play the video. 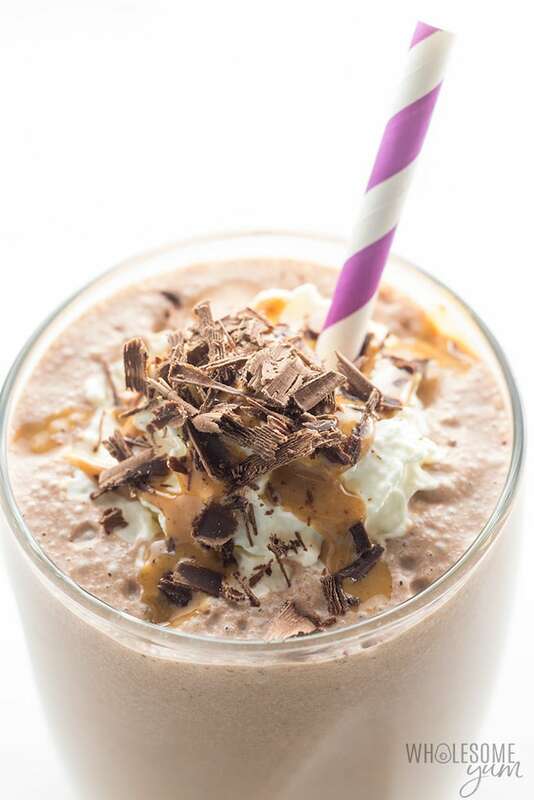 It's the easiest way to learn how to make a Chocolate Peanut Butter Smoothie! I was confused when the recipe didn’t call for ice but I have a single serve blender and I didnt have any room left to add any so I figure I would try it as is and OMG SO DAMN SMOOTH!!! I am fairly new to this diet and many days I have no appetite so I was looking for a smoothie I could force down my throat in the mornings. But there was no force here! I LOVED IT!!! so creamy so delicious. I used Truvia for sweetener and I only used 2 tbsp so I could test the sweetness and honestly that was plenty for me. This was absolutely delicious I will be having these for breakfast. I’m going to see how it stores overnight in the fridge. 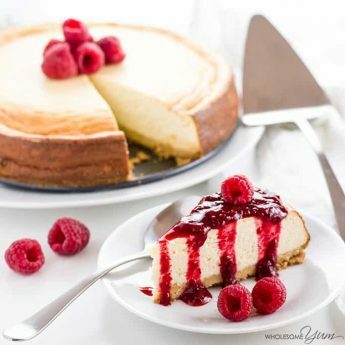 Thanks so much for this amazing recipe! I can’t speak right now… YUM !! I liked this recipe but 6 tbs of swerve was way too sweet and gross. I would put 1 tbs maybe 1.5. Had to add ice, more almond milk to reduce the sweet. Thanks for the recipe! I love this! It’s just just what I was looking for! I made it with almond butter because it’s what I had at home. Delish! Thank you, Samantha! I haven’t tried adding cold brew but that sounds absolutely delicious, I’m sure you can! Okay thanks, can’t wait ti try it! 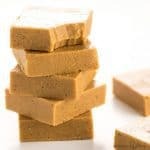 Peanut butter and chocolate were just meant to be and I love how you made it low carb. This was great after my morning workout. This is delicious!!!!! I did about 2/3 the recipe because my blender is small and my daughter and split it. It was amazing! Great sweet tooth craving fix!! You saved our day! Omg, so good! And it’s definitely super filling. I ground up coconut sugar because that’s all I have in the pantry, but other than that I followed the recipe exactly. Definitely will replace my beloved, and yet awful for me, Dairy Queen Blizzard. Thank you! Hi Katie, Oh no! The number of servings and serving size is on the recipe card. At least the good news is this will keep you full for a long time! When I calculated the calories, the cup of cream was 414 and then the pb was 380 so how is the whole thing only 435? Hi Dawn, The nutrition info is per serving. 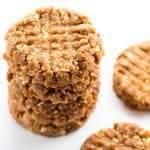 The recipe makes 3 servings (3 cups). Too yummy to be healthy for ya! YUM! Quick, Delicious and Sooooooo filling ! 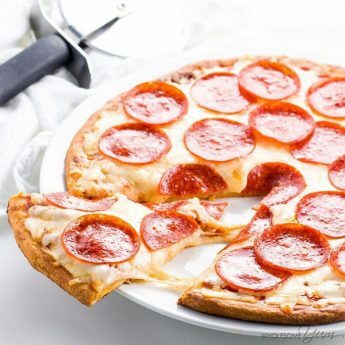 Love all the easy and yummy recipes here, thanks !! Thanks for sharing your tips with us, Ana! WOW — this smoothie worked for me. 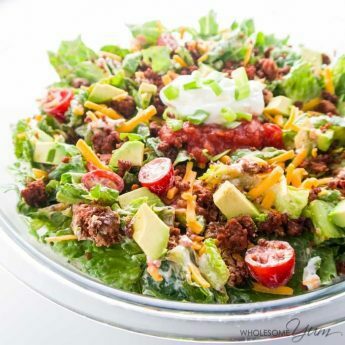 I usually dislike most low carb “substitution” recipes, but this tasted great and kept me full for HOURS. Glad to see it keeps in the fridge. I can usually drink finish off anything sweet, but not this one! If you have versions in other flavors, I’d like to know! I am so happy you liked it! Have a great day! Can not wait to try this tomorrow. I’m going to have this in place of my bulletproof coffee. I’ll share with my sister who *just* started keto. I hope you and your sister like it, Susan! You are welcome, Muniza! Thanks for stopping by! Oh my God Maya, I made this recipe this morning and it is soooooo good!!!! I don’t really like the taste of almond milk in a smoothie but in this recipe, you can’t detect it at all! It is creamy and just sweet enough. Thank you again for such an amazing and easy recipe!! I am so happy you liked it, Angele! Please come back soon! I am allergic to almonds so I used Cashew milk and it was amazing! This is fantastic! Kid and husband approved! Have you ever frozen it to make a soft serve ice cream? Just wondering before I try! Thank you, Miranda! I haven’t but it could work. Let me know how it goes if you try it! Ohhh Maya Goddess! This is so good! I blended mine with ice in the Ninja and it’s like a milkshake. 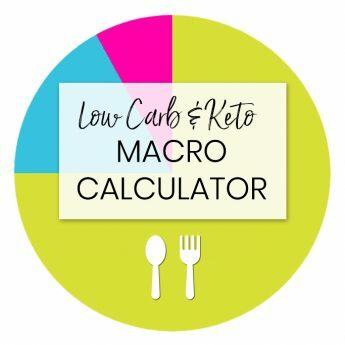 I’ve been trying various low-carb ice cream recipes but I may be done with that for a while! Thank you so much, Lori! Great idea to blend it with ice, too. My go to breakfast. I’ve must have had 20 servings of this and the good thing is that it keeps will in the fridge for three days. So I make a batch per the default recipe. Filling and tasty. Many thanks! I am so happy you liked the smoothie, Dan! Can you add low carb protein powder to your smoothies? Hi Linda, Yes, absolutely! I do that often with this one, too. I just reread the recipe and saw where it said liquid sweetener is ok! I can NOT wait to try this! Who ever would’ve thought I kinda like cooking again! Thanks again! I really hope you like the smoothie, Kim! Have a great day! Oh no!!!! I thought I ordered the confectioners sweetener but I got granular. I love your recipes and just got the maple extract to do some maple syrup for this weekend. Was looking forward to this smoothie too. Do you think the granular will be ok? I have Swerve liquid and powder and monk fruit blend too? Thank you for the awesome recipes and info! Hi Kim, You can make the smoothie with granulated sweetener too, but you might notice a bit of a grainy texture. You could try grinding it in a coffee grinder or food processor to make it powdered. I thought that peanut butter was considered to be part of the legume family and therefore not carb friendly. Can you please clarify? 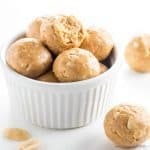 Hi Tina, You can definitely enjoy peanut butter in moderation if you’re low carb (or keto). Just make sure to choose one that does not have sugar added in the ingredients, and preferably no hydrogenated oils. The one I use is linked on the recipe card and has 4g net carbs per 2-tbsp serving. 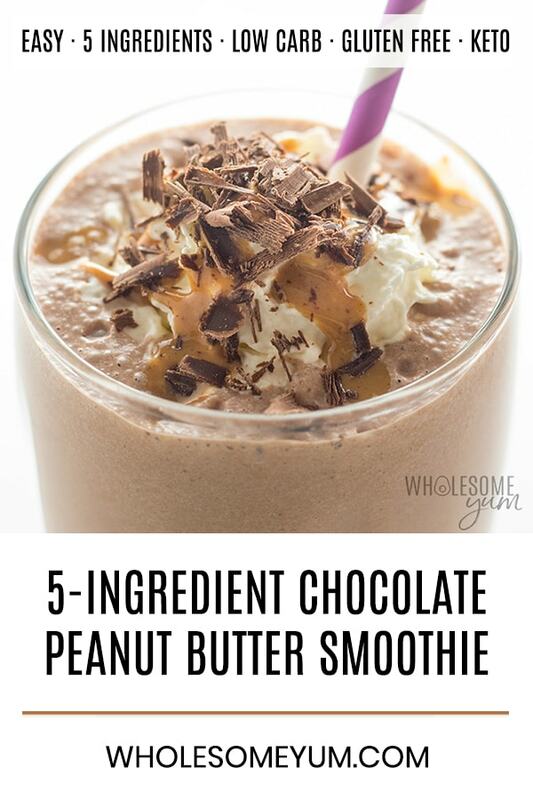 Each serving of this smoothie actually has less than that amount of peanut butter. Thank YOU for such a versatile/flexible recipe!!! Over The Top… this is going in my permanent file!! I am so happy to hear that, Deb! Thanks for stopping by! Looks amazing, can not wait to try this one!!! Thank you, Carol! Let me know what you think when you make it! That’s really nice of you to say, John! Right now the recipes are only available on my site. I’ll definitely keep other flavors in mind for future recipes. Hope you like this one! Hello! I saw your sweetener chart. Another sweetener I noticed was not on the chart was Bochasweet. It is a sweetener extracted from a Japanese squash. I was hoping you could update your sweetener chart and post to include this sweetener. I notice a lot of people have not included it. Thanks so much! Hi Amy, Thank you for the feedback. I’ll add this sweetener to my list to investigate. My initial search came up with very limited information, so I can’t tell yet if it’s one I would recommend or not. 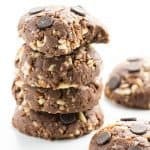 Happy that you’ve finally found a way to make your husband loving starting his day with a healthier and even tastier option than his insanely beloved previous one! Thank you, Roberta! You’re absolutely right. I didn’t mark this as paleo because of the peanut butter. You could use another nut butter, but since peanut butter is right in the name, I omitted the paleo label altogether. Hope you like it!